Hyundai's Blue Bonus event is now on! 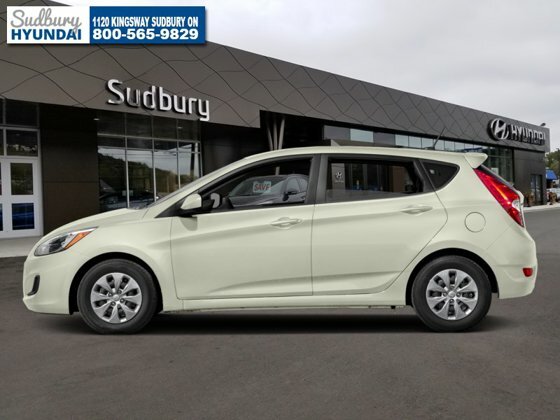 With handsome styling, above-average performance, and solid build quality, this Hyundai Accent represents a strong choice for a small car in the subcompact class. It's hard to find style, safety, and value in a fun to drive package, but that's exactly what this Hyundai Accent delivers. Leave compromise behind and enjoy this fun, economical Accent filled with modern design and advanced safety features. Let this Hyundai Accent change your idea of small cars. This white metallic hatchback has a manual transmission and is powered by a 1.6L I4 16V GDI DOHC engine. Motivated by that frugal motor it gets 8.8 L/100 km in the city and uses just 6.5 L/100 km out on the highway according to Transport Canada. Our Accent's trim level is L Hatch. This subcompact Accent L is a tremendous value and fun to drive. It comes with an AM/FM CD/MP3 player with a USB port, power doors, 60/40 split folding back seats, auto-off headlights, variable intermittent windshield wipers, stainless steel exhaust, four-wheel anti-lock disc brakes, and more. This vehicle also has the following features: Power Windows. To view and download a brochure open this url https://www.hyundaicanada.com/Content/PDF/accent_en.pdf" target=_blank>https://www.hyundaicanada.com/Content/PDF/accent_en.pdf. Total rebate of $4150 is reflected in the price. Rebate of $4150 is reflected in the selling price and qualifies for 4.27% Hyundai Smart Rate Financing Rate. Lower finance rates are available for those choosing to finance without the cash incentive. 4.27% financing for 96 months. Buy this vehicle now for the lowest bi-weekly payment of $68.80 with $0 down for 96 months @ 4.27% APR O.A.C. ( Plus applicable taxes - $440 documentation fee / Total cost of borrowing $2196 / Total Obligation of $14310 ). Incentives expire 2018-07-03. See dealer for details. All new vehicles come equipped with a block heater. $220 has been added to all prices to reflect this addition.